I love the religious holidays in Italy. It is time to renew our traditions, to bring family together and to teach the youngster what really matters. About a month before Easter the “palmari” , farmers who are true palm artists start to prepare the leaves of palm trees by choosing the female leaves only, which are the longest and thinnest leaves (how do they recognize them is still a mystery to me). For a few weeks the leaves are left to dry covered with a canvas tarp, then they start twisting them in all shapes possible and they become master pieces of art. They are sold in all shoppes in Italy the week of Palm Sunday to give as a gift and a symbol of peace to friends and family members. In history palm leaves were considered a symbol of triumph, victory and acclamation of royalties. Today they are the symbol of peace and love. In some regions of Italy, the faithful take a branch of olive tree with the twisted palm to church to benedict them with holy water, then they place both on the Easter table well overflowing with good food. Jesus Christ was welcomed to Jerusalem with olive branches, today they are equally used especially in areas where palm trees don’t grow. In northern Europe where even the olive trees don’t grow, this Easter tradition of giving a branch as symbol of peace continues with local leaves and flowers twisted together. Each year Easter is defined a “low holiday” when it arrives around March and coincides with the pruning of the olive trees, or is defined as a “high holiday” when arrives around April with a warm Spring and when the olive trees might already have new green shoots. In beautiful Sorrento, South of Italy, on Palm Sunday there is a beautiful show going on in the streets of this quaint town. 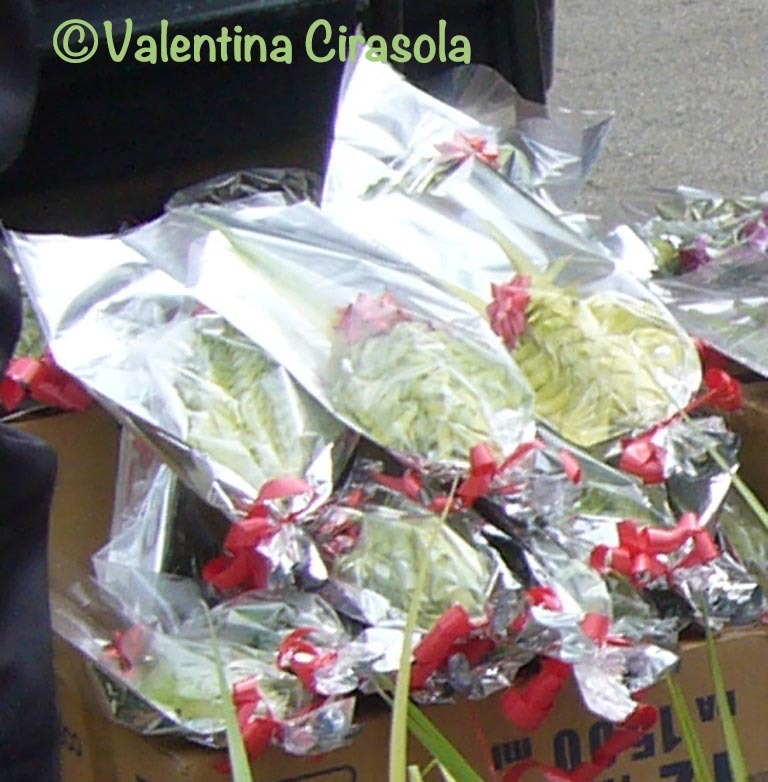 Women carry in their hands colored confetti made into the shape of branches or small trees and men carry on their shoulders large branches of olive trees with small cheeses called caciocavallo attached to the branch with colored ribbons. The story goes that around 1551 many Saracens ships (Arabs) were coming to invade Sorrento, but the sea started to get agitated and shipwrecked all of them. From then on, Sorrento celebrates its peace and victory with the benediction of confetti and caciocavallo, instead of twisted palm leaves and olive branches as in the rest of Italy. 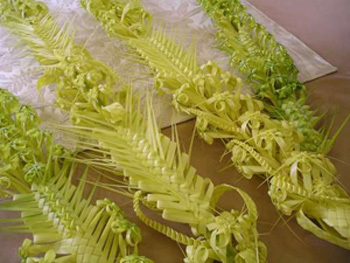 Decorating the house through the Easter month with palm leaves will bring a sense of peace and a very unusual form of art everybody will admire. The palm leaves made up this way will last for a good three months. She designs architectural landscape as a complement to the residential design concept as a unity. She has been described as the “colorist”.